Situated at No 77 Hang Luoc - a very quiet street just 50 meters from the front steps of Dong Xuan Market in the centre of the city. Just one minute from the hotel, you will see the beautiful Catheral which attracts many tourists each year around, especially at Christmas time, The Mid-autumn Festival, and New Year's Eve of Hanoi. Hoan Kiem lake, (Vietnamese: Hồ Hoàn Kiếm, meaning "Lake of the Returned Sword" or "Lake of the Restored Sword", also known as Hồ Gươm - Sword Lake) is a lake in the historical center of Hanoi, the capital city of Vietnam. The lake is one of the major scenic spots in the city and serves as a focal point for its public life. And it is at eight minutes walking distance from our hotel. The newly built Ha Long Hotel has amazing service exceeding many of the other hotels in the area. The hotel is perfectly located to explore the exciting Old Quarter and to visit Dong Xuan night market, Walking street (just open from 6:30pm to11:30pm on Friday, Saturday and Sunday), Ho Chi Minh Mausoleum,One Pillar Pagoda, Temple of Literature and other local sites. All in walking distance from the hotel, as are shopping and banking facilities. There are also many restaurants and entertainment venues nearby. 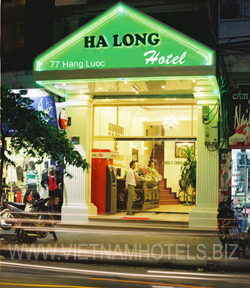 At Ha Long Hotel , you will enjoy a luxurious stay with many modern facilities .You will be taken care of by a team of dedicated and professional staff. The all inclusive price intitles you to breakfast, all day tea/coffee, fruit and welcoming fresh flower in your room. You also have access to ADSL and wifi internet. For those of you just passing through we offer a transit stop so you can securely store you pack while you wonder around Hanoi and grab a shower before leaving on night trains for Sapa, Hue, Hoi An.... and buses for other exciting destinations. Retreat from the daily hustle and bustle of HANOI indulge yourselves in the exclusive tranquility and luxury of your stay at our Ha Long Hotel which meets all your needs. For your convenience we can arrange pick ups from Hanoi Train Station and airport transfers upon request. - Superior: These are small rooms with 2 single beds inside. - Deluxe: These rooms are bigger than Superior. But they also have 2 single beds. - Luxury: These rooms are the biggest rooms with double bed, but we can arrange 1 more if you want (or order). Those still have balcony to see the outside view. In general, each room has its own beauty and they are tastefully decorated by classical style. From the room you can see the view of the 2 famous bridges (Long Bien, Chuong Duong) and The Red River; moreover, you even can see the people’s life in ancient streets. But the view is narrow or extensive depend on how the room is (The more rooms are expensive, the more views are beautiful). All rooms are comfortable and managed by warm and friendly staff. You will see that every room is equipped air-conditioning, model bathroom, big screen TV with Satellite and cable channel with the best quality. Restaurant is located on the 8th floor – the highest floor of our hotel. It is a large place for panoramic view of Hanoi city with various European, Asian, Vietnamese foods and beverage. You can enjoy the view outside while having breakfast. At the heart of B&R is the open kitchen in an elegant color. This is the main signature of the restaurant, a brilliantly conceived concept that is also a truly professional workplace. From here you can discover the best Hanoi delights and relax. Moreover, you can appreciate Vietnamese foods but don’t need to go to any far place. Even if you want a family meal with Vietnamese foods, please give us a little time in beforehand, we always serve you thoughtfully.